Last night Camden accepted the recommendation that council tax bills will rise, a decision that will be ratified at full Council on the 26th. For the second year running, it will rise by 4.99%, an increase comprised of a 2.99% council-tax increase and an ‘Adult Social Care’ precept of 2%’. Average Camden band D council tax was £1,417 in 2017/18, which will rise by £70 to £1,487 this coming year, if the increase is approved on the 26th. Before everyone jumps up and down and starts grumbling about the 1.99% council tax rise, remember that inflation was 2.7% over 2017. Also, almost every council in the country is doing exactly the same, so Camden is no exception. Up until this year, 4.99% was the maximum rise in tax allowed before a referendum had to be held. That number is rising to 5.99%, so let’s see next year. Council tax accounts for 12% of total council spending (£101 million of total spending of £824 million). Retained business rates account for £89.3 million, fees and rents bring in £166.5 million (of which council tenants contribute ~£120 million directly or via benefits), and the remaining £466.6 million comes from central government. *note these are for 2017/18 but 2018/19 is roughly the same, although there has been some reduction in the central government grant. Government funding comprises money for statutory responsibilities, such as schools, adult care, and housing. 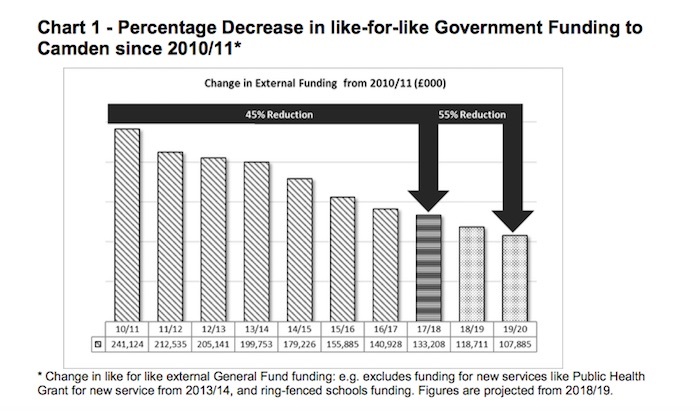 This statutory funding has been squeezed in recent years, but not cut dramatically. What has been cut dramatically is the portion for discrectionary services. In 2010, this totalled £241 million, but it has fallen every year since and in 2018/19 it will be £119 million – basically half. Former council finance chief Theo Blackwell argued that Camden faced the seventh highest cut in the country. 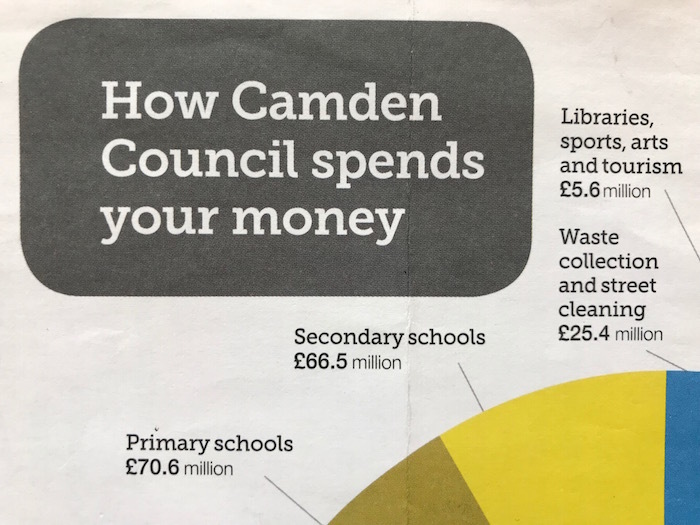 Despite the cuts, he also said that “resident satisfaction with how Camden spends money is at an all-time high, and gone up by 20% in last 4 years”. 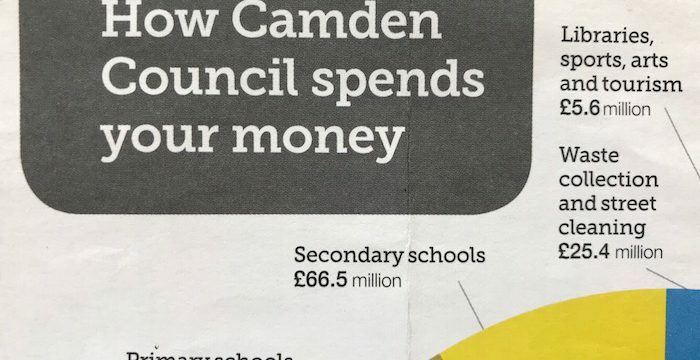 Camden has coped with budget cuts by making savings. Most visibly for most residents, it moved waste collections from weekly to fortnightly, which saved £5 million per year. This has become something of a political football. The Conservatives say they would reverse the change while Labour claims it’s the result of the cut in the central government block grant. Surely, whichever side of the political divide you sit on, we can all agree that the council should spend money as efficiently as possible? As we get further into the savings programs, the easy savings have all been made and there is concern that some of the harder savings might not be realised, which would lead to Camden’s deficit rising. As the chart below shows, a growing share of savings fall into the “maybe” and “uncertain” to be realised categories. These are the expected savings with the probability they will be realised; green = fairly certain, amber = maybe, red = uncertain. And they will have to find further savings on top of these. Where does the council spend all this money? Every year it produces a finely sliced pie chart that breaks it down. The biggest area of spending is education (about 25% of the total), which is spent according to government rules. The block grant for education has been cut by 3% a year for the past few years. In 2018/19 it will rise by 0.5% (still a cut in real terms, given inflation is 2.7%). *note these are for 2017/18 but 2018/19 are roughly the same, although there have been some reductions. There were a couple of sizeable one-off items in the 2018/19 housing expenditure. The evacuation of Chalcots estate in the aftermath of the Grenfell fire led to emergency housing costs of £17.5 million and the cost of replacing the cladding was another £31 million. The council is asking central government to bear at least some of the cost but will have to find the extra money from its reserves. Another change to the balance sheet stems from the changes to housing benefit and universal credit. So far only a small number of people have been switched over to universal credit but as has been widely reported, the process has not been smooth and has led to an increase in rent arrears. As more recipients get switched over, Camden expects these arrears to rise. Meanwhile, central government is mandating a 1% rent reduction per year, until 2020/21. From then on they will increase again by 1% (though, depending on inflation, this is likely to still result in less income in real terms). Adult social care makes up a large part of Camden’s expenditure. The last few years have coincided with a real-terms squeeze on the NHS budget and a rise in the number of older people, particularly of the very old. Between 2013 and 2023, the number of people aged 90+ is projected to increase by 50%. This is why central government has allowed councils to add a ring-fenced 3% precept for adult social care. 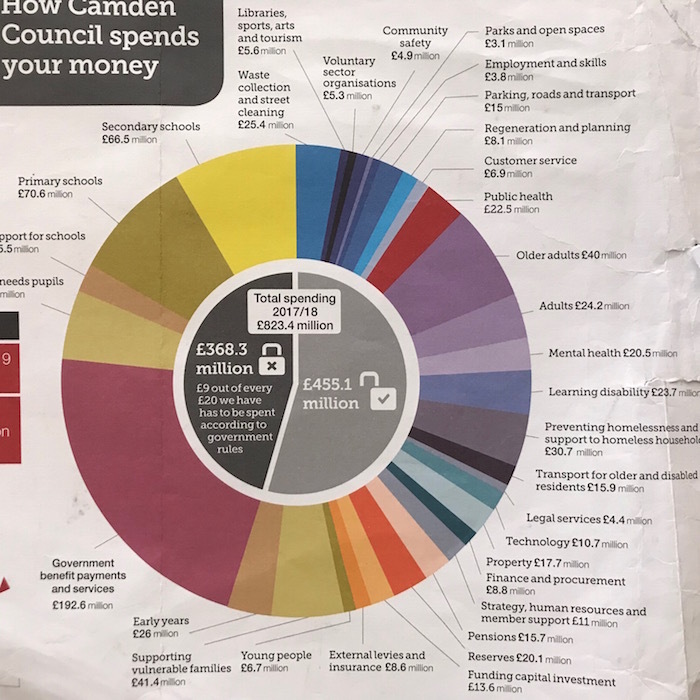 Still, Camden has been able to set a balanced budget for this year, assuming frozen block grant, there are budget deficits forecast for 2020/21 (of £36 million ) and beyond. 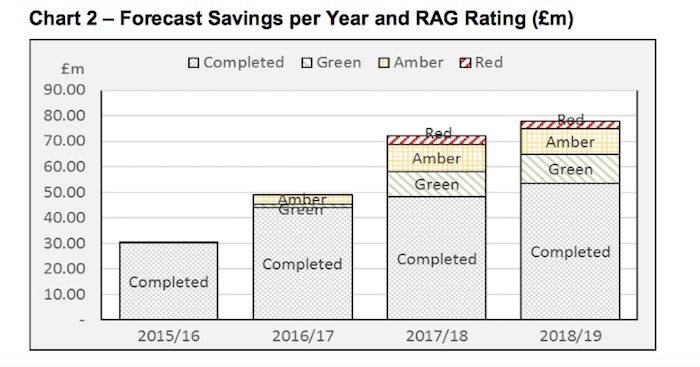 Plus some of the expected savings are looking uncertain (as in RAG – red/amber/green graph above). Since Theo Blackwell departed to be Sadiq Khan’s digital tsar, Fortune Green councillor Richard Olszewski has taken over as cabinet member responsible for Finance. Richard said that the medium-term financial strategy Camden established in 2014 has helped it mitigate the impact of the cuts. It has also focused on ‘outcomes-based budgeting’ to help it spend money more effectively. Finally, the council also digitised many services, such as parking permits, making them work better (and cheaper). “Council tax was brought in 1990 after the Poll Tax and was rough and ready but by 2018 its now more rough than ready”. The simple truth is that, broadly speaking, Londoners massively underpay council tax relative to the rest of the country as banding has not kept up with the stratospheric growth in house prices in the capital. But re-banding would be political suicide for the Tories who would hurt their home counties base and for Labour who’d alienate their urban voters. Richard says that there will need to be a further round of cuts, though won’t yet be drawn on specifics. 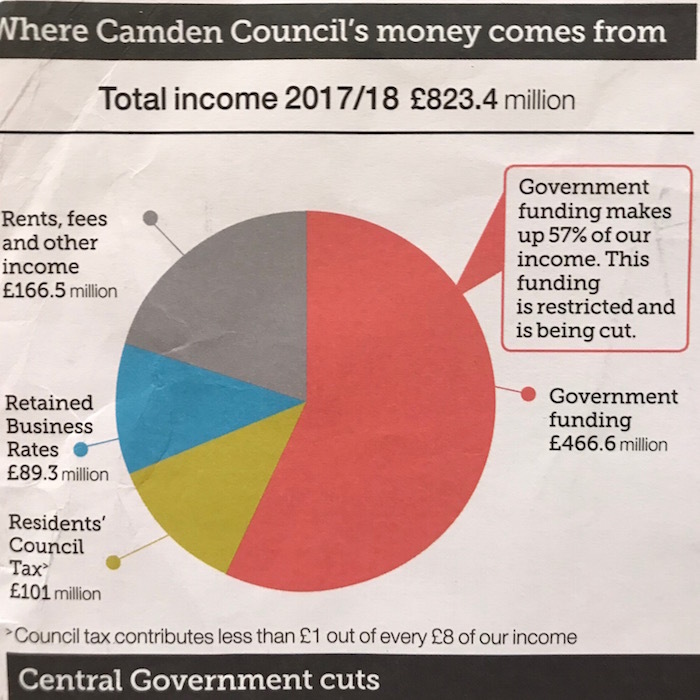 Camden is dominated by Labour councillors, and the local party tries to plan its budget in line with Labour motivations with a focus on tackling inequality and spending more on early years provision. Camden Conservatives’ finance spokesperson is Swiss Cottage councillor Don Williams. He argues that the Conservatives would try to be more efficient. He points out that Westminster (population 220,000) has 1,700 employees, while Camden (population 246,000) has 3,968. He also suggested ways of raising more revenue, such as through advertising, which now brings in £5 million a year. Every year, the Conservatives produce an alternative budget that goes into more detail about how they would save money. Pages 7-11 of this document set out their ideas (for 2017). Note that the Conservatives accept the need for the 3% precept, so even under the Tories your bills would rise, but they would freeze the council tax component. In the end, last year their proposal would have led to a £21 annual saving over the actual rise in band D council tax, which doesn’t seem like a radically different vision. West Hampstead property price rises set to outpace London average Brunch at Hām; was it Hamtastic?